Streak and odour free, Self-Tanning Mousse effortlessly creates a healthy bronzed glow. 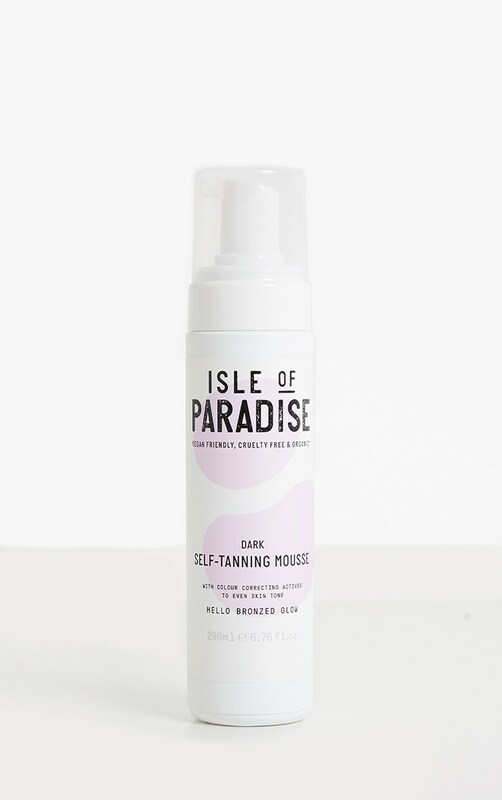 Formulated with HyperViolet complex which is proven to reduce orange tones, this hydrating tanning mousse also contains colour-correcting actives for an even, natural tan. Aqua (Water), Dihydroxyacetone, Propylene Glycol, Ethoxydiglycol, Glycerin, PEG-40 Hydrogenated Castor Oil, Decyl Glucoside, Glycereth-26, Erythrulose, Tropaeolum Majus Flower/Leaf/Stem Extract, Panthenol, Aloe Barbadensis Extract, Citrus Grandis (Grapefruit) Peel Oil, Cocos Nucifera (Coconut) Oil, Eucalyptus Globulus Leaf Oil, Mentha Piperita (Peppermint) Oil, Persea Gratissima (Avocado) Oil, Salvia Hispanica Seed Oil, Salvia Officinalis (Sage) Oil, Methoxyphenyl t-Butylphenyl Propanediol, Agastache Mexicana Flower/Leaf/Stem Extract, Ascorbic Acid, Ethylhexylglycerin, Propanediol, Sodium Metabisulfite, Parfum (Fragrance), Phenoxyethanol, Benzoic Acid, Dehydroacetic Acid, CI 19140 (FD&C Yellow No.5), CI 17200 (D&C Red No.33), CI 15985 (FD&C Yellow No.6), CI 42090 (FD&C Blue No.1), CI 14700 (FD&C Red No.4).